Amazon Echo and its voice assistant, Alexa, might be the current market leaders in voice-activated smart technology, but recent announcements from the 2018 Consumer Electronics Show have shown that Google fully intends to challenge Amazon for that crown. The past few days have seen some big developments – and a couple of even bigger teasers – for the future of Google’s smart assistant, the imaginatively-named Assistant. On Tuesday, the first day of CES 2018, Google published a post to its official blog announcing partnerships with more than a dozen electronics companies to produce Google Assistant smart speakers – some with a very significant upgrade. The blog post also highlighted the breadth and depth of “Actions”, the name given to built-in apps and integrations for the Google Assistant. At the same time, Search Console users began receiving notifications that their podcast, recipe and news content was eligible to be included in a new “Actions directory”, which is being rolled out over the next few days. This appears to be part of an increased focus on what can be accomplished with Assistant, shifting its emphasis from finding information (Google’s long-time speciality) to carrying out tasks. There’s a lot of news to unpack, so let’s look at what exactly these developments involve, and what they mean for SEOs and the wider industry. 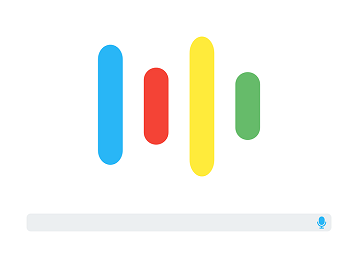 While a comparatively smaller development than the flashy revelations of major electronics partnerships and smart displays, Google’s introduction of native support for podcasts, recipes and news to the Assistant is nevertheless big news for SEOs. Google is gradually rolling out a browsable directory of Actions for the Google Assistant, allowing users to more easily discover what the Assistant is capable of. Podcasts, recipes and news will be the first wave of content added to this directory – though only content published with AMP, or marked up with structured data such as Schema.org, will be getting the nod. This means that webmasters and SEOs who have been marking up their content with structured data are already ahead of the curve in making that content available via voice – while those who haven’t must hop on the structured data (or AMP) bandwagon if they want to be eligible. Structured data has long been touted by its fans as a great way to get search engines to better surface content from your site, particularly in the form of things like rich snippets or Quick Answers. But it can be time-consuming to add and maintain, and the immediate benefit isn’t always so obvious. This new use case, however, shows that there is a huge potential advantage to “future-proofing” your website by adding structured data markup. If Google continues to make Assistant a primary focus going forward, then this could be the key to content optimization and discovery in a voice-driven world. Hey, Google – look what I can do! As discussed, Google is clearly keen to shift the focus of its voice capabilities away from information discovery towards actions. To this end, it’s heavily promoting “Hey, Google” as the slogan for the Google Assistant, placing it in huge letters on top of its CES installation, and creating a #HeyGoogle Twitter hashtag (complete with a unique Assistant emoji) to accompany their Assistant-related updates. But wait, you might be thinking – isn’t “OK Google” the wake phrase for the Assistant? Yes, Google has been a bit unclear on this point, but it seems that “Hey, Google” has been an alternative wake phrase for the Assistant for a while now. In late 2016, the website Android Police reported that the Google Home responds to both “OK Google” and “Hey, Google”, but Google voice search (e.g. on mobile) responds only to “OK Google” – making it possible to differentiate if you have multiple devices within earshot. Now, as Google moves its focus away from search and towards actions, “OK Google” is out and “Hey, Google” is in. While both videos show what can be done with the Assistant, the 2016 video emphasizes “finding” things, linking the Google Assistant directly and visually with the Google search bar, and positioning it as “your own personal Google” – like a search engine for your life. By contrast, Google’s new messaging focuses on the many things the Google Assistant is capable of, emphasizing the availability of “over a million Actions”. This is not to say that Google has abandoned searching via Assistant, however; it made sure to develop powerful natural language search capabilities as its first order of business, with CEO Sundar Pichai demonstrating their potential at Google I/O in 2016. But now, Google is getting serious about challenging rivals Amazon, Microsoft and Apple for dominance of the smart assistant and smart device arena. If Google continues to make either structured data markup or AMP a prerequisite for content being discoverable with Assistant, then this will mean SEOs must invest in either one or the other if they want to be competitive in this space. Finally, we have the very exciting news that Google has partnered with a range of electronics manufacturers including iHome, LG, Lenovo and Sony, to produce Assistant-powered smart speakers – some of which will include a screen. This is Google’s response to the Echo Show, Amazon’s new smart speaker with an inbuilt touchscreen, which was released in the US in June 2017. Crucially for Google, it will be able to make use of its YouTube ownership to one-up Amazon, after withdrawing YouTube support on the Echo Show and the Fire TV late last year. Google’s smart display speakers will also offer video conferencing via Google’s video calling app, Duo. In short, the key takeaways from the last few days are that Google is going all-in on its bid to be Amazon’s main competitor in the smart speaker space. What this means for marketers and SEOs in the long run mostly remains to be seen, however. In the short term, it will be interesting to see how marketers with podcasts, recipes, and news get on with Google’s new Assistant Directory. Google is keen to get their opinions as well, with John Mueller tweeting that he would “love to hear any feedback on the process”. Have you had any Search Console notifications about content being included in the new Assistant Directory? Will you be investing in structured data or AMP, if you haven’t already, in order to be eligible for Google Assistant? Leave a comment with your thoughts on the latest developments.